The content described here was removed from the game after the 2016 Jester's Festival event. 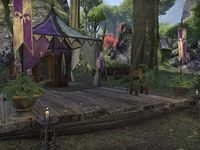 The Jester's Festival is a tent found north of Vulkhel Guard. It is only marked during the Jester's Festival event. During the event, several NPCs can be found here. The Jester's Festival: Join in the frivolities of the Festival of Fools. These NPCs are only present while the event is live. This page was last modified on 19 November 2018, at 07:19.